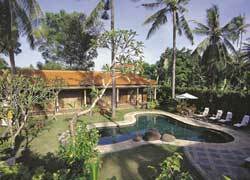 Bali Spa A long-established spa Siesta offers great service and varieties of menus, and it is good access from an airport, 5 minutes by car. The spa is convenient for the use before departure because of good location from air port, so many guests spend relaxing time in Siesta after they check-out the hotel and waiting departure time. Staffs can speak English also. Ion foot bath and shoulder, arm massage. Scrub for knee and foot, make more soft heel point. Accupoint massage will bring out natural human healing power. Full body oil massage, the oil using depending on your body conditions. It is effective for shoulder pain and leg pain. Pouring sesami oil on fore head. It is effective fot balaning mind and body. It will reset the balance of mind and spirit by pouring sesame oil to an area on a forehead and a head called "Third Eye". Power of the charcoal was added to an effective Cream Bath for asthenopia and stiffness in the shoulders. The waste material of the scalp which is not produced is removed by the shampoo with adsorption power of the charcoal. The traditional massage promises you to be satisfied. It dips the foot into the RO water which purified in particular and promoting the blood circulation by shoulder and arm massage. The toxin which collected in the body in a moment is drained from the sweat gland of the sole. Finally you could more refresh in foot reflexology. The new package for only 2 couples a day! Why don't you stay in a quiet peaceful area surroundedby the great nature after checking out your hotel on your last day in Bali? Enjoy trying to be a therapist for one day in the school! 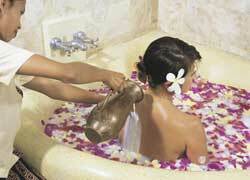 In A Course, you choose one from 5 menus and take 2 hours lesson, and try 2 hours spa treatment in the afternoon. B Course doesn’t include spa treatment. You can take full 4 hours lesson. C Course finishes up around noon. It doesn’t include lunch. For beginner and any level esthetician. In this cours you can learn professional treatment skill one category a day or one category in 3 days. Free Shuttle Service is offered from Kuta, Legian, Seminyak (except some areas), Nusa Dua, Benoa, Jimbaran, and Sanur area. Children can wait at the lobby and in the treatment room. ※Massage can be changed to Soft Massage without strong stimulation for guests who have atopic dermatitis and sensitive skin; please ask at the counseling. ※Possible to bring own Massage Oil for treatment.